When you first begin working with a CRM tool like HubSpot, it may be a little overwhelming. There are so many options and ways to use the tool that it may be difficult to know where to begin. We’ve found that setting up the following features within the tool and implementing these organizational tactics, you will be able to get the most out of using HubSpot right from the beginning. While there are many more features and ways to use the tool, these are the ones that are the most beneficial to us and our clients who are getting started using HubSpot. One of the first features we suggest setting up is the email function. When you enable this feature, HubSpot will track and log all email communication with a contact in their record. This will allow you to view past communication with a client, learn what they do and do not respond to, and track when they have viewed or clicked on emails they have been sent. This knowledge is a powerful piece of data that will allow you to learn more about your customers and tailor your marketing and sales strategies to specific contacts and customer groups. Once your email has been connected to HubSpot, you will also be able to use the Templates and Sequences features. These tools are especially valuable to a sales team who send multiple follow up or first touch emails to contacts. Templates allow you to create drafts of common emails you use so you can avoid typing them over and over or needing to copy and paste each time you send an email. As you can see in the example below, templates provide blank spaces for information that you need to fill in when you send the email, but they provide you a quick way to send a common follow up email to leads, prospects, and customers either on computer or while on the go through the mobile app. 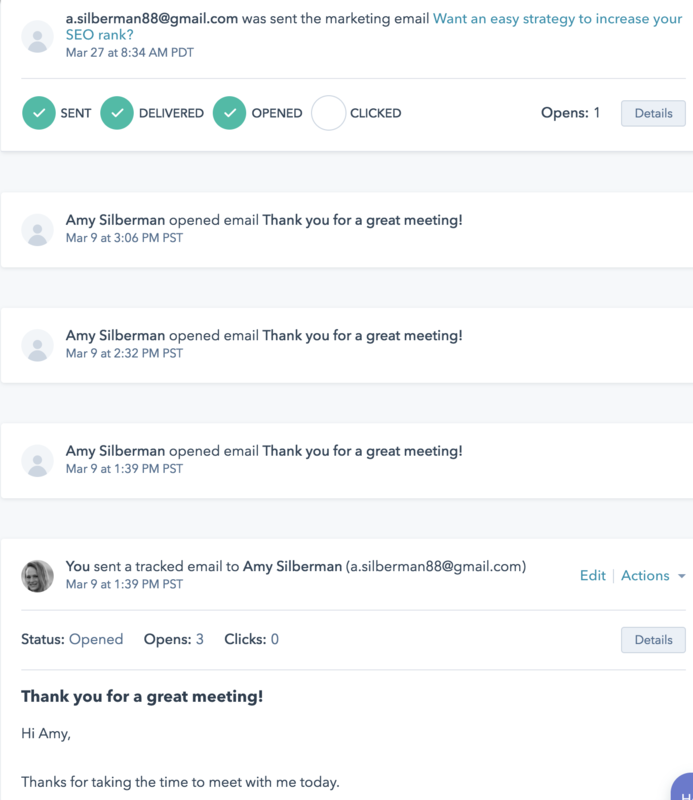 Templates are easy to insert into emails either through your own email client or through the HubSpot email option in the contact record once you have connected your email to HubSpot. Multiple templates can also be added to a sequence. This is useful if you need to send multiple follow up emails to a contact. Each email in a sequence will send at a predetermined time and will continue sending the next email until a contact either responds or the sequence ends. 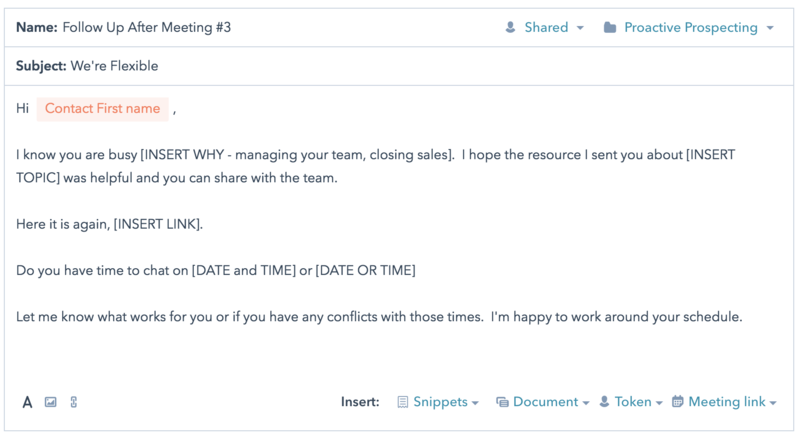 Both templates and sequences are very useful for teams as they save time and create an efficient process for you to send out common emails to contacts. By connecting your email to HubSpot, you will be able to take advantage of these tracking and time-saving tools. After you have connected your email, you should then connect your social media profiles to HubSpot. Currently, HubSpot supports Facebook, Instagram, Twitter, LinkedIn, and Google+ accounts. HubSpot makes it easy to share posts directly from the platform to your social media accounts. It also has an option to auto-publish any blog articles or other content you create to your connected social media accounts. Social media is also an important tool to learn what people are saying about your company and your industry. By connecting your accounts with HubSpot, you are able to monitor different social networks for industry mentions, company mentions, competitor mentions, and more. By having posting, social listening, and social reporting functions all in one place, you will be able to stay in touch with your followers on social media while continuing to post and interact with them on social networks. Once you have connected your social accounts to your portal, you are ready to start organizing. We find that pre-set naming conventions and folders are the best way to keep all files organized and easily accessible. In addition to organizing your files, we also recommend setting up your dashboards. The dashboards are the first thing you will view when you enter your HubSpot portal and they give you a great overview of what is happening with your contacts, content, website, and more. These are the items we have found to be the most helpful on each dashboard. We recommend using these items as a starting point when creating your own personal dashboards and then you can see if you would like to add or subtract any items to give you the best picture of your company. The next step you must take is to come up with some topic clusters and content strategies. We’ve talked before about the importance of using topic clusters and optimizing your site content for topics relevant to your ideal customer. HubSpot provides a simple way to ensure all your content is appropriately linked to the correct topic cluster. As you can see in the photo below, the main topic is linked in the center of the cluster. The leaf topics are linked in the branches and then linked back to the main topic through the stems. 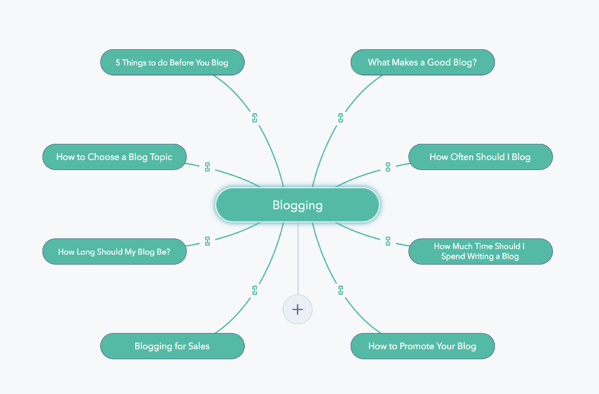 By using the topic and strategy clusters, you can tie all you content, emails, and more to the topics you want to be known for. This will increase your SEO rank and provide you with more website traffic. The final feature to incorporate to make your job easier is the tasks and calendar function. Every user in your HubSpot portal can use the tasks and calendar feature. You are able to assign tasks to follow up with contacts, send sales emails or phone calls, or review contact’s deals. You are also able to schedule content such as blogs, marketing emails, or social media posts and assign each to a team member. After your emails, social media, and contacts are connected to your HubSpot portal, the tasks and marketing calendar are an important function to keep your team organized and on task. The calendar allows you to view your scheduled and assigned content at a glance over the whole month so you never lose track of what is being posted and when. Sales tasks allow you team to stay on track and not allow any new leads or current customers to slip through the cracks. These tasks are an easy way to stay on top of things and make your job easier. HubSpot is a great CRM tool, but it is just that - a tool. It will make your job as a marketer or salesperson much easier, but only if it is used correctly. 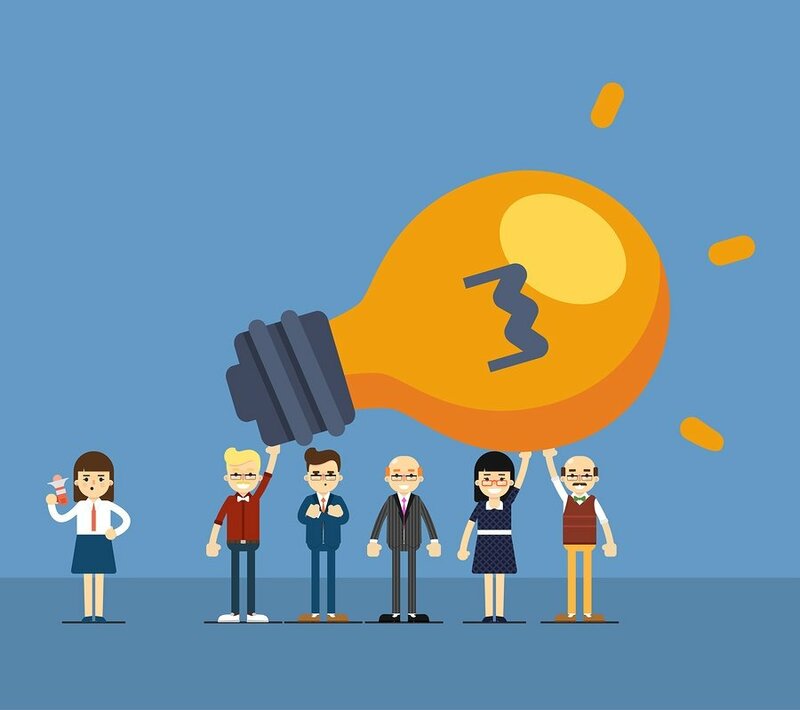 By using these tips and tricks to get started with the tool, you will be able to take advantage of its functions and use them in a way that benefits you, your team, and your customers. Nothing will slip through the cracks and your job will be much easier, freeing up time for you to focus on your current customers and gaining new ones! Want to learn more about HubSpot and see if it is the right fit for your company? Contact us for a free HubSpot consultation!